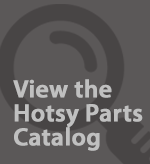 Hotsy Cleaning Systems, Inc., the local Hotsy dealer for Wisconsin and the U.P, stocks a large supply of the most commonly used pressure washer replacement parts such as guns, wands, hoses, nozzles, valves and hose reels. We have a catalog with well over 20,000 parts, so if we don’t stock a part you need, we’ll order it for you right away. In addition to pressure washer parts, we also carry a number of pressure washer options and accessories designed to improve productivity. For example, a telescoping lance is ideal for cleaning windows on a two-story building. The lance extends up to 24 feet to spray, and will save you from climbing ladders, making your cleaning much safer. A surface cleaner is ideal for cleaning flat surfaces, like driveways, parking garages and sidewalks. A surface cleaner will attach to a hot or cold water pressure washer, where the operator pushes it similar to a lawn mower. A tremendous time saver, surface cleaners also eliminate the light and dark “zebra stripes” that can often occur with a pressure washer. Clean faster and deeper with a turbo nozzle, which uses a pencil thin, 0° spray rotary conical pattern that cleans more aggressively than a regular spray nozzle. Remove tough build-up and grime deeper and faster. To learn more about these and other pressure washer parts and accessories, please give us a call. We’d be happy to quote a price over the phone. Call us toll-free (800) 242-2353. We have locations in Madison, La Crosse, Eau Claire, Wausau, Green Bay as well as our main location in Delafield.